State tax changes are not made in a vacuum. States often adopt policies after watching peers address similar issues. Several notable trends in tax policy have emerged across states in recent years. Four states cut corporate income taxes in 2017, three as part of planned multiyear reductions, and one (North Carolina) as a further rate reduction after the successful implementation of multiyear reforms. States continue to reduce other taxes on capital as well, with New York continuing a multiyear phaseout of its capital stock tax and Mississippi about to embark on its own phaseout. Four other states have repealed theirs since 2015. Tax incentive evaluation laws continue to take hold as states grapple with narrowing tax bases. Gross receipts taxes are being contemplated in a growing number of states as corporate income tax revenues decline, though concerns about their economic effects have generally helped stave off their adoption. As e-commerce’s share of total retail sales continues to rise, states are mounting increasingly energetic efforts to tax remote sales through indirect and direct challenges to current case law. As public attitudes have shifted, states are increasingly viewing the legalization of recreational marijuana as fiscal as well as social policy. Three states legalized and taxed recreational marijuana in 2017, and there is a growing emphasis on setting tax rates low enough to drive out the black market. Two states (Delaware and New Jersey) are in the process of repealing their estate taxes, while two others and the District of Columbia raised exemption thresholds, continuing a decade-long trend away from taxes on estates and inheritances. Many states put off major changes to their tax codes this year due to uncertainty about federal tax reform. Should a tax reform bill be adopted at the federal level, this will create both challenges and opportunities for states, which should drive much of the state tax reform conversation in 2018. State tax policy decisions are not made in isolation; the challenges faced by one state often bedevil others as well, and the proposals percolating in one state capitol often show up elsewhere. Ideas spread and policies can build their own momentum. Sometimes a trend emerges because one state consciously follows another, and in other cases, similar conditions result in multiple states arriving at the same solutions independently. Identifying state tax trends serves a dual purpose: first, as a leading indicator providing a sense of what we can expect in the coming months and years, and second, as a set of case studies, placing ideas into greater circulation and allowing empirical consideration of what has and has not worked. From a groundswell of interest in marijuana taxation to a growing emphasis on tax credit evaluation, and from states shifting away from taxes on capital to challenges to the Quill decision reaching a crescendo, the past year contains tax policy storylines that provide insights on the year to come. Some trends worth noting have been with us for years, while others are just emerging; some are promising, while others might be thought of as cautionary; and some are time-constrained reactions to exogenous factors, while others represent innovations other states may wish to adopt. In 2017, Arizona concluded a multiyear phasedown by reducing its corporate income tax rate to 4.9 percent (from 6.5 percent initially); Indiana cut its tax from 6.25 to 6 percent as the state continues a course of planned rate cuts (from 8.5 percent initially); New Mexico cut its rate from 6.6 to 6.2 percent with further reductions intended in 2018; and North Carolina reduced its corporate rate from 4 to 3 percent, with a further reduction to 2.5 percent approved by the legislature. Although few states have repealed their corporate income taxes, their volatility, narrowing bases, economic impacts, and modest contribution to state revenues have all contributed to states’ decisions to reduce reliance on the tax. States have been slowly but steadily eliminating or reducing reliance on tangible personal property taxes (generally levied on business property like equipment and fixtures) for years. Similarly, most states outside the southeast have repealed their capital stock taxes, with Pennsylvania, Missouri, Rhode Island, and West Virginia the most recent to abandon them, while New York is in the midst of a multiyear phaseout and Mississippi will begin one next year. There appears to be an emerging consensus that these taxes impede economic growth and are ill-suited to the modern economy. E-commerce represented 9.1 percent of all retail sales in the third quarter of 2017, a slice of the retail pie that states are increasingly aggressive about taxing. The Supreme Court’s 1992 Quill Corp. v. North Dakota decision, decided less than a year after the World Wide Web became available to the general public and three years before the “Amazon.com Books” website launched with a promise of “one million titles, consistently low prices,” prohibits states from mandating sales tax collections from retailers who lack “physical presence.” After years of chafing at Quill, states are increasingly challenging its holding—some by exploiting perceived loopholes and others by mounting a direct challenge to the decision. Several states, most notably South Dakota, have enacted legislation in conflict with Quill for the express purpose of relitigating the decision. The state has asked the U.S. Supreme Court to grant certiorari in the South Dakota v. Wayfair, Inc. case, while Wyoming and others wait in the wings with their own challenges should the Supreme Court pass over South Dakota’s challenge. Amazon itself now collects and remits taxes in all states which impose a sales tax, as do many other retailers due to their physical presence (stores, distribution centers, and other facilities) in those states. The next frontier of taxation for these companies, though, is “marketplace” sales, where the company facilitates sales for a third party. This applies not only to auction sites like eBay Inc., but also to the marketplace sales managed by Amazon and other online sellers. Even if the company itself is required to collect and remit sales taxes in a given state, there is no similar obligation for the seller who lists her products on that company’s website. Marketplace legislation would obligate the listing company to collect sales tax on these facilitated transactions. Such legislation was enacted in Minnesota, Pennsylvania, and Washington this year, with South Carolina pursuing similar efforts under existing law. After Colorado implemented legislation requiring companies with “factor presence”—that is, companies which meet a test like volume of sales, with or without physical presence—to report all transactions involving in-state customers to the state revenue department, and to notify those customers that they may owe use tax, other states have followed, with some looking specifically at extending the requirement to marketplace sellers. Massachusetts’ approach, known as “click-through nexus” (or “cookie nexus” by critics), rests upon the claim that a when a corporate website deposits a “cookie” on a person’s computer, that tax nexus is established in that state. Other states are looking to follow the Massachusetts example. Finally, some states are more aggressively pursuing affiliate nexus, in which the presence of an affiliate (for instance, someone who gets paid a sales commission for linking to products) is deemed sufficient to meet physical presence requirements. Just over a decade ago, gross receipts taxes appeared on the verge of extinction, with the antiquated form of taxation persisting (at the state level) only in Delaware and Washington. In recent years, however, several states have turned to this highly nonneutral tax, chiefly as an alternative to volatile corporate income taxes. 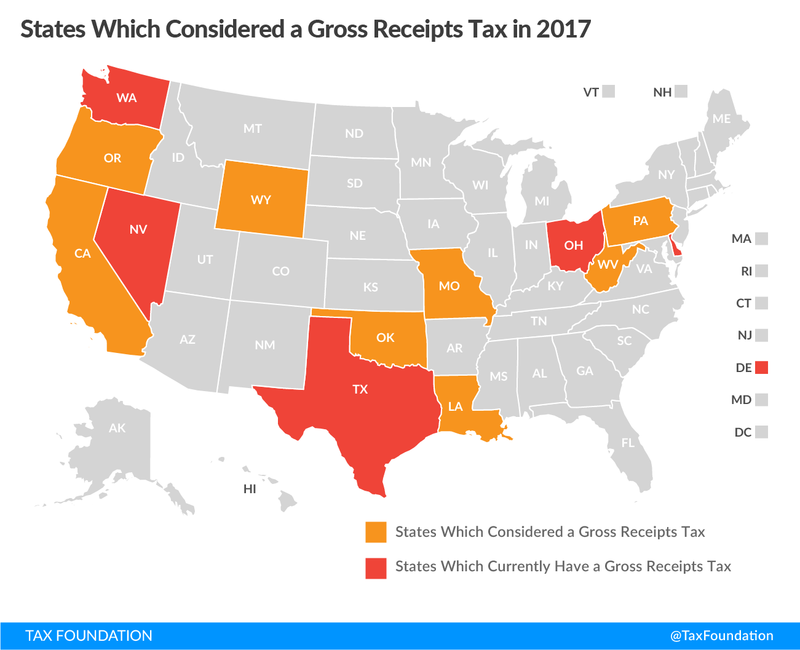 Ohio, Texas, and Nevada all adopted gross receipts taxes in recent years, while eight states—California, Louisiana, Missouri, Oklahoma, Oregon, Pennsylvania, West Virginia, and Wyoming—contemplated their adoption this year. Interest in gross receipts taxes, which had waned throughout the past century, saw a similar surge in the mid-2000s, when Kentucky, Michigan, New Jersey, Ohio, and Texas all adopted such taxes. Kentucky, Michigan, and New Jersey quickly repealed their new gross receipts taxes, citing adverse economic consequences. Gross receipts taxes in Ohio and Texas—states which both forgo corporate income taxes—survived. In West Virginia, gross receipts taxes were featured in several successive budget proposals, and serious proposals were mooted in Louisiana and Oregon, but ultimately no state adopted a new gross receipts tax in 2017. However, additional proposals can be expected in coming years, as the revenue pressures driving their reemergence have not abated. As public attitudes toward marijuana have changed, states are increasingly revisiting their statutes on the possession, sale, and taxation of marijuana. Many states now allow medical marijuana, others have decriminalized possession, and a small but growing number have legalized recreational marijuana. Thus far, every state which has legalized marijuana has done so in concert with the implementation of a new excise tax regime. A marijuana-specific tax regime is not theoretically essential, as it could, post-legalization, simply fall under the state sales tax like most other consumer goods. The notion that marijuana (like tobacco products, alcohol, and select other goods) should have its own tax regime has, however, been largely uncontroversial. These taxes also fund the states’ marijuana regulatory regimes, though in all cases they raise revenue considerably in excess of these costs and help fund general governmental expenditures. In November 2016, voters in California, Maine, Massachusetts, and Nevada approved recreational marijuana, with legalization and taxation effective in 2017. Implementation of the Maine ballot referendum has been delayed, but the other three states join Alaska, Colorado, Oregon, and Washington in legalization. Six of these states impose ad valorem taxes, such as Oregon’s 17 percent tax on marijuana. Alaska imposes a more traditional excise tax at $50 per ounce, while California adopted a hybrid system which includes both a 15 percent ad valorem tax and flat per-ounce taxes on flowers and leaves. Initially, excise taxes tended to be quite high. In 2016, the four states with recreational marijuana were Washington with a 37 percent excise tax, Colorado at 29 percent, and Alaska and Oregon at 25 percent. These rates may have been too high to drive out gray and black markets. Since then, Alaska, Colorado, and Oregon have reduced marijuana tax burdens, and states which implemented marijuana excise taxes in 2017 tended to adopt lower rates. As more states contemplate marijuana legalization, they are likely to consider excise tax rates closer to those adopted in 2017 than those set in 2016. While 2015 and 2016 saw the greatest spurt of tax incentive evaluation laws, the trend toward greater scrutiny of tax incentives continued in 2017. In Arkansas, the InvestArk credit (the state’s largest business tax credit) was repealed, while Alabama overhauled its Historic Rehabilitation Tax Credit and Missouri suspended its Low-Income Housing Tax Credits, which the governor has argued is ineffective as currently structured. According to the Pew Charitable Trusts, state utilization of tax incentive evaluations and studies is on the rise, and this trend can be expected to continue, particularly as corporate income tax revenues decline. In addition to the pending repeals in Delaware and New Jersey, two states—Minnesota and New York—and the District of Columbia are continuing to raise their exemption thresholds. Should federal tax reform result in the repeal of the federal estate tax, even more states may repeal their taxes rather than taking on additional responsibility for administration and oversight. If the federal government adopts tax reform, some states can be expected to move swiftly to make changes to their own tax codes, adjusting rates or modifying conformity provisions in response to changes at the national level. Uncertainty about what Congress will do, however, left many states in limbo, and was almost certainly a contributing factor in several states’ decisions to postpone reforms and changes that might otherwise have gone forward in 2017.
the contraction of the state and local tax deduction, which, in the long term, could have a modest effect on state and local tax rate considerations. Eliminating the personal exemption broadens the tax base considerably more than raising the standard deduction narrows it (at the federal level, these changes would be paired with a far larger child tax credit, but this provision would not flow through to the states). The other changes, although not insubstantial, do not change the fact that, for most states, the tax base would be broader after federal tax reform, forcing states to decide whether to keep the additional revenue to grow government, cut rates to avoid an automatic tax increase, or use the broader base to help pay down broader tax reform. Although no new tax triggers were adopted in 2017, they featured in tax reform discussions in numerous states, and are likely to remain a significant part of the tax reform toolkit in the coming years. States also vary in how closely they conform to the federal tax code, but several states delayed conformity or decoupled from certain provisions this year, a possible trend that bears watching, particularly in the event of federal tax reform. Even as federal tax reform efforts took center stage, states continue to engage on tax policy, and certain trends are abundantly clear. State taxation of corporate income is well past its heyday, with states grasping for revenue alternatives from gross receipts taxes to broader sales tax collection authority. Taxes on capital continue to lose popularity and are widely regarded as uncompetitive, though their importance as a revenue stream has kept them in place—albeit under pressure—in many states. As public attitudes about marijuana change, states increasingly see legalization as an opportunity to grow state revenues. Perhaps the most important trend to watch in 2018, however, is one that has yet to begin. Should the federal government adopt substantial tax reform legislation, this will have an almost immediate effect on state budgets (in most cases, increasing revenue through broader bases), which is likely to emerge as the driver for state tax reform considerations in the year to come. Scott Greenberg, “Pass-Through Businesses: Data and Policy,” Tax Foundation (Jan. 17, 2017), 7, https://taxfoundation.org/pass-through-businesses-data-and-policy/. Scott Drenkard, “Several States Will Start 2017 With Corporate Tax Reductions,” Tax Foundation (Dec. 30, 2016), https://taxfoundation.org/several-states-will-start-2017-corporate-tax-reductions/. Joyce Errecart, Ed Gerrish, and Scott Drenkard, “States Moving Away from Taxes on Tangible Personal Property,” Tax Foundation (Oct. 4, 2012), https://taxfoundation.org/states-moving-away-taxes-tangible-personal-property/. Morgan Scarboro, “Does Your State Levy a Capital Stock Tax?” Tax Foundation (Oct. 5, 2017), https://taxfoundation.org/state-levy-capital-stock-tax/. U.S. Census Bureau, “Quarterly Retail E-Commerce Sales, 3rd Quarter 2017,” CB17-182 (Nov. 17, 2017), https://www.census.gov/retail/mrts/www/data/pdf/ec_current.pdf. Anne Quito, “This is What Amazon’s Homepage Looked Like When it Launched 21 Years Ago This Month,” Quartz (July 18, 2016), https://qz.com/734985/this-is-what-amazons-homepage-looked-like-when-it-launched-21-years-ago-this-month/. Jef Feeley, “Internet Tax Ruling Worth Billions Poised for Supreme Court Review,” Bloomberg (Sept. 14, 2017), https://www.bloomberg.com/news/articles/2017-09-14/south-dakota-internet-tax-ruling-tees-issue-up-for-high-court. Paul Jones, “Wyoming Waiting for Court Action on Anti-Quill Bill,” State Tax Notes (Oct. 11, 2017), https://www.taxnotes.com/state-tax-today/sales-and-use-taxation/wyoming-waiting-court-action-anti-quill-bill/2017/10/11/1wg2f. Nick Wingfield, “Amazon Sellers Brood as States Come Calling for Taxes,” The New York Times (Nov. 15, 2017), https://www.nytimes.com/2017/11/15/technology/amazon-sales-tax.html; Stephen Long and Michael Tedesco, “A New Trend in the Market: Sales and Use Tax Obligations Imposed on Marketplace Operators,” Baker McKenzie SALT Savvy (Aug. 3, 2017), http://www.saltsavvy.com/2017/08/03/a-new-trend-in-the-market-sales-and-use-tax-obligations-imposed-on-marketplace-operators/. Colorado Department of Revenue, Taxation Division, “Use Tax notice and Reporting Requirements,” https://www.colorado.gov/pacific/tax/usetax. Carley Roberts, Chris Beaudro, and Stephanie Do, “How States Are Trying New Strategies To Collect Sales Tax,” Law360 (Oct. 10, 2017), https://www.law360.com/articles/973031/how-states-are-trying-new-strategies-to-collect-sales-tax. Nicole Kaeding, “The Return of Gross Receipts Taxes,” Tax Foundation (Mar. 28, 2017), https://taxfoundation.org/return-gross-receipts-taxes/. For more on the Ohio Commercial Activity Tax, often regarded as the most successful gross receipts tax, see Jared Walczak, “Ohio’s Commercial Activity Tax: A Reappraisal,” Tax Foundation (Sept. 26, 2017), https://taxfoundation.org/ohio-commercial-activity-tax-2017/. Samuel Stebbins and Grant Suneson, “Pot Initiatives: Predicting the Next 15 States to Legalize Marijuana,” 24/7 Wall Street in USA TODAY (Nov. 14, 2017), https://www.usatoday.com/story/money/2017/11/14/pot-initiatives-predicting-next-15-states-legalize-marijuana/860502001/. Joseph Bishop-Henchman and Morgan Scarboro, “Marijuana Legalization and Taxes: Lessons for Other States from Colorado and Washington,” Tax Foundation (May 12, 2016), https://taxfoundation.org/marijuana-taxes-lessons-colorado-washington/. Nicole Kaeding, “Saying Goodbye to InvestArk,” Tax Foundation (Mar. 14, 2017), https://taxfoundation.org/goodbye-investark/. Josh Goodman, “More States Use Evaluations to Reform Tax Incentives,” The Pew Charitable Trusts (Nov. 15, 2017), http://www.pewtrusts.org/en/about/news-room/opinion/2017/11/15/more-states-use-evaluations-to-reform-tax-incentives. Jacob Barker, “Greitens, Appointees Move to Withhold Controversial Low Income Development Tax Credits,” St. Louis Post-Dispatch (Nov. 17, 2017), http://www.stltoday.com/business/local/greitens-appointees-move-to-withhold-controversial-low-income-development-tax/article_3fbd0023-698b-515d-9103-77cc6f097fbc.html. 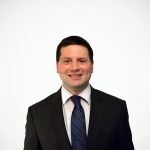 Jared Walczak, “State Inheritance and Estate Taxes: Rates, Economic Implications, and the Return of Interstate Competition,” Tax Foundation (July 17, 2017), https://taxfoundation.org/state-inheritance-estate-taxes-economic-implications/. Note, though, that New Jersey’s governor-elect favors halting estate tax repeal. The American College of Trust and Estate Counsel, “State Death Tax Chart” (July 7, 2017), https://www.actec.org/resources/state-death-tax-chart/. Joseph Bishop-Henchman, “Seven Things States Should Monitor in the Federal Tax Bill,” Tax Foundation (Dec. 4, 2017), https://taxfoundation.org/seven-things-states-monitor-federal-tax-bill/.